Whether it's dropping dimes, scoring goals or being on top of the leaderboard, sports have always had a way of transcending the field of play. It's 2018 now and we are amidst a revolution ... an esports Revolution. Games like “OXO” (similar to tic-tac-toe) and “Pong” were just the beginning of video games when they were first introduced in the 1950s. A few decades later, in the 70s and 80s, kids and adults alike were enamored with the antics of "Mario & Donkey Kong," and the "blast-tastic" fun of "Space Invaders" in arcades nationwide. Fast forward to 2018 and we now have home consoles, mobile games, and handhelds. Wherever we walk, we can game. The evolution of technology has led to a revolution of epic proportions. "Overwatch League" and "League of Legends" are both commonplace in the world of games and sports. None of those tournaments or leagues compare to Evolution Championship Series (EVO). A worldwide tournament exclusively focused on fighting games, EVO brings together the world's best professional and amateur players to compete in a double elimination format with players earning over $30,000 at the event. These tournaments have become a major source of income for players. Professional gamer Hajime Taniguchi cashed in with a reported take home of $35,750.00. Top professional gamers earn anywhere between $200,000 to over $400,000. That amount of money can pay for four years at RIT and that's the low end of the earnings track. Even in the realm of collegiate sports, scholarship money can be earned for victory. Connor Dudarchik, a 3rd-year Computer Security Major and current manager of the Player Unknown's Battlegrounds team for the RIT Esports Club, recalled the compensation at a TESPA competition (an inter-collegiate league created by Students at the University of Texas, Austin in partnership with Blizzard games) as being particularly lofty. "The payout was $8,000 per team member, a whopping $56,000 take home for the whole team," he said. These payouts are fueled by sponsors and their new-age athletes. An athlete is defined by the Merriam-Webster Dictionary as "a person who is trained or skilled in exercises, sports, or games requiring physical strength, agility, or stamina." Evan Hirsh, a third year Computer Science Major and president of the eSports club talked about what distinguishes an esports competitor from a traditional athlete. The RIT Esports club was founded two years ago as an attempt to make teams that compete between colleges. Hirsh explained that he formed the club as a way to build upon a experiment with a few friends — they had already put a structure around building a team for "Overwatch." 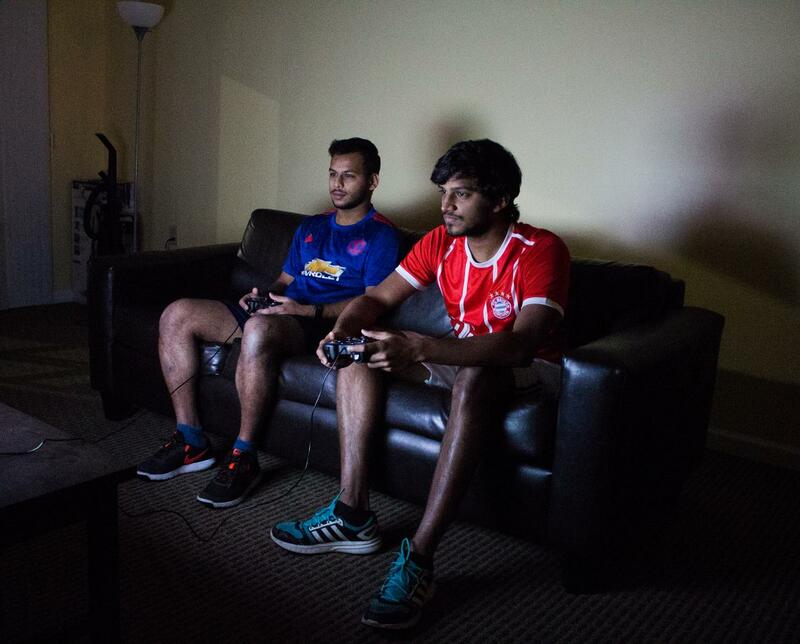 Fast forward two years and the club is now comprised of multiple teams ranging in games from "Counter-Strike Go" to "Overwatch," "Rocket League" and more. "[The purpose is] to be the collegiate equivalent of a professional team. We build teams for competition,” Hirsh said. “The main difference between the two is the physical element. It's almost completely removed in esports, yet it still requires some reflexes, reaction skills, and timing ... I hope the term [athlete] becomes broader, something along the lines of a competitor because all traditional sports, esports and competition sports like chess share that spirit of competition." When watching a live stream or attending the events, competitions are fierce. Whether it's a few friends or a massive tournament like EVO, there is a range of emotions that traditional sports and esports share. For example, there is the calm intensity between two evenly-matched opponents and the mutual respect each of those competitors shares during the ups and downs of the match. And just like in traditional sports, nothing compares to the come-from-behind-win from the underdog that was down most of the match. Evan described some of his favorite moments with the club — one in particular: being at a Rocket League open tournament where the club took home a nail-biter win over University of Rochester, winning the series 3-2. Hirsh also dove into the regiment of players. "I would say it varies depending on the player, but the average competitor plays upwards of 15 hours a week on practices, [in] spare time and competition. That encompasses everything," Hirsh mentioned. Dudarchik recounted his times being a player and how much time he put into it. "Practices would consume six hours a week, two hours of competition and six hours on my own time alone; that was if I wasn't busy. I'd usually put in about 20 hours or above some weeks if my workload wasn't too high." The club also hosts tryouts, practices and friendly matches from time to time. For anyone interested in competition or video games, this is the club to join. While exploring the world of video games, it's highly impossible to avoid stumbling upon a few of the classics such as "Donkey Kong" and "Space Invaders." More modern day games that come to mind are "Fortnite: Battle Royale," "Rocket League" and "Blaze Blue" — all three of which are on their way to icon status. For example, "Blaze Blue: Cross-Tag Battle" is one of seven headliners at this year’s EVO. The revolution has also shown that the New Age athlete can come in any shape, size or form. What remains constant amongst different kinds of athletes is the spirit of competition, the dedication to the craft and the love of the game. Whether dribbling a ball, scoring a goal, getting the round ending kill or stringing a combo together, esports is not only reshaping how sports are thought of, but also how we define the modern athlete. There’s no telling where this revolution will take the world of sports and gaming. The only way it’s projected to go is up. Plug in for the ride because it’s going to be a fun one.